Bot Inboxer is a Facebook Messenger Bot application. You will be able to set your messenger bot for multiple pages. The bot can reply with text, post back button, quick reply, image, video, template, carousel template & so on. Setting up your messenger bot with Bot Inboxer will reply all your customers in messenger very fast. To use this app you will require https. 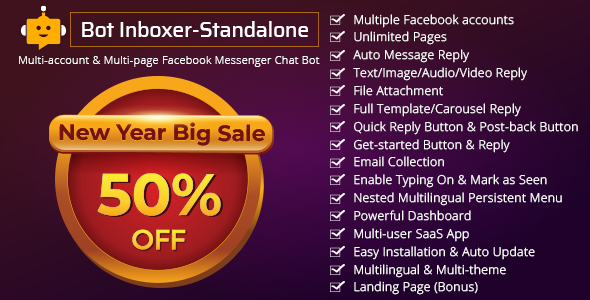 Bot Inboxer is the standalone version of Bot Inboxer Addon for FB Inboxer.